1944 – Australia saw the emergence of a period of post-war optimism and growth following the austerity of the war years, with the possibility of tertiary education within the reach of more people than previously. The Commonwealth Reconstruction Training Scheme (established during 1944) saw an increase in Commonwealth financial support for universities. 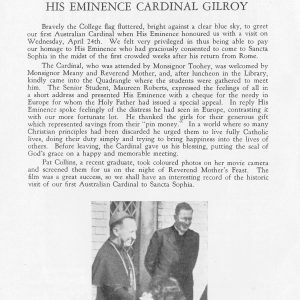 1946 – His Eminence Cardinal Norman Gilroy visited the College on 24 April, shortly after his return from Rome where he was elevated to the rank of Cardinal on 18 February by Pope Pius XII. Following luncheon in the Library, His Eminence met with and addressed the students in the Quadrangle and gave his blessing. The students presented him with a cheque for the needy in Europe, for whom the Holy Father had issued a special appeal. 1946 – saw the death of Florence Lane Mullins, one of the original Councillors of Sancta Sophia College. A great supporter of the College over many years, she left a bequest of £50. 1946 – Another founding member of Council, Dame Constance D’Arcy was elected as Chairman of Council on 7 March, replacing Dr Walter Burfitt. 1947 – The Vice Principal, Mother Arnold, was granted a leave of absence to assist with the establishment of Duchesne College in Brisbane. 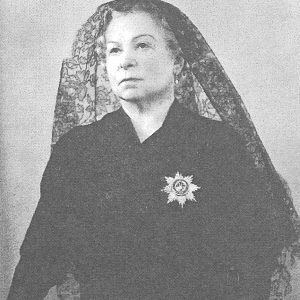 1947 – The Sancta Sophia Association (sometimes erroneously referred to as “the Ex-Students’ Association”) was founded on 25 March at the instigation of Mary Collingridge who was appointed the inaugural President. The report of the Association’s formation, and account of its subsequent activities, was warmly received by the College Council at its meeting of 4 September. 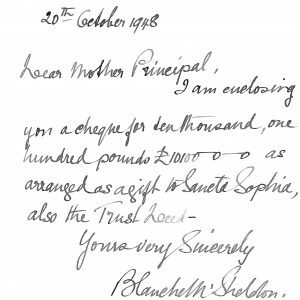 1948 – At the meeting of the Finance Committee of 20 October, a letter from Lady Sheldon to the Principal was read, announcing a gift of £10 100 as a Trust Fund for three scholarships, to be named after her three daughters, for students from Rose Bay Convent to reside at Sancta Sophia. 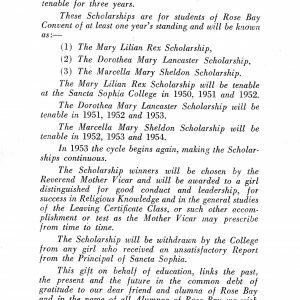 1948 – Other generous bequests were left to the College; £500 for “general purposes” was left by Mrs Angela Hepburn, and £1 000 for the Amelie Salmon Scholarship was bequeathed by Miss Louise de Lauret. 1950 – The University of Sydney marked its Centenary. The Principal and Vice Principal of Sancta Sophia represented the College in the academic ceremony in the Great Hall. 1950 – The death of Dame Constance D’Arcy, long standing supporter and member of Council, on 25th April caused much sadness among the College community. In paying tribute to her, Monsignor Meany said “we were all very proud of her achievements; every Catholic in Sydney was proud of her achievements, and she herself, though a modest woman, was proud of what she did as a Catholic. Everything she did, she did as a young woman – she made the most of every opportunity the offered.” Dame Constance left a generous bequest to the College, comprising a cabinet containing valuable and beautiful china, a coffee service and a canteen of silver. 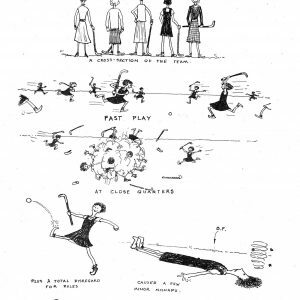 1951 – The much-loved Vice Principal, Mother Arnold, was transferred to Melbourne. At the Council meeting of 1 March, the Chairman Monsignor Meany spoke appreciatively of her services as Vice Principal and the affectionate respect with which the students regarded her. 1951 – Overseas students appeared at the College in the post-war period for the first time, some via the Colombo Scheme and mostly post-graduate students. Among them were two Fulbright Scholars, one from the University of California and one from Guam. 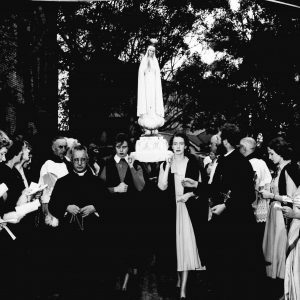 1951 – On 8 October, the College hosted the Pilgrim Statue of Our Lady of Fatima. The quadrangle, festooned with flags, bunting a welcome arch and banners, was the scene of a huge gathering of dignitaries and college students when the statue was honoured by a procession and an altar erected in front of the library door. 1951 – The death occurred of Miss Kate Egan, Foundation member of Council, and long-serving Honorary Secretary, on 9 September. 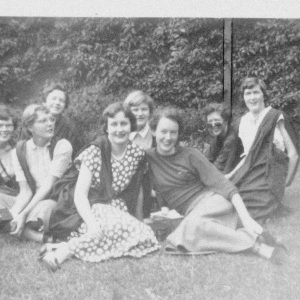 Miss Egan had held the position of Honorary Secretary since 1930, and like many of her peers, had been involved in the move to establish Sancta Sophia College since the 1920s. A bequest of £500 from Miss Egan’s estate was received to support the Annie Mary Toohey Scholarship (Annie Toohey was Miss Egan’s sister). 1953 – Reverend Mother Macrae was granted a leave of absence from the College for 1952, to go to a Sacred Heart Convent in Auckland. In her absence, Mother Hore acted as Principal and Mother Eileen Leyne as Vice Principal. Mother Macrae was warmly welcomed back at the Council meeting of 5 March. 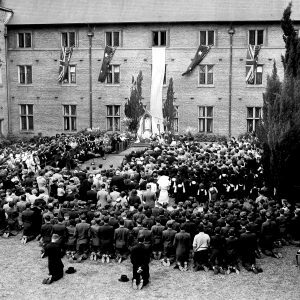 1954 – On 8 September, His Eminence Cardinal Gilroy blessed the Foundation Stone of the Sheldon Hall. Once again, the generosity of Sir Mark and Lady Sheldon in providing for the expansion of the College was widely acknowledged. 1955 – The death of Lady Blanche Sheldon in July, was recorded with much regret and sadness in the Minutes of the Council meeting of 1 September. Writing in tribute to her, Archbishop O’Brien said “that beautiful college would always remain a memorial to her generosity”. The high esteem in which her fellow Councillors held her is reflected in a testimonial of appreciation presented to her in 1948-49. Mrs Anne Spruson, Mrs Eileen Lyons, Mrs Esmey Burfitt and Dr Mary Burfitt Williams – this quartet of women were all foundation members of the Sancta Sophia College Council, appointed by the Archbishop of Sydney in 1930. 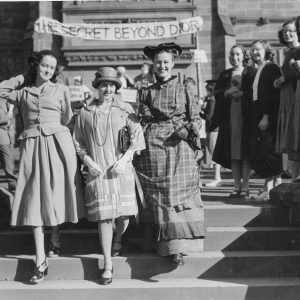 All four had been staunch supporters of the movement to establish a Catholic Women’s College within the University of Sydney, and served on Council for many years. Between them, they provided a century of service to the College Council.